Mild Gunman (known as Ready, Steady, Splat! 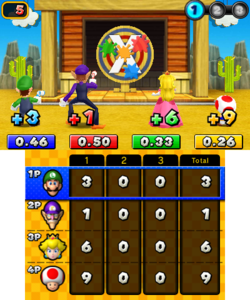 in PAL versions) is a General minigame from Mario Party: Island Tour. The American name is a pun on the video game Wild Gunman. One of the targets falls back into place. Blue Toad is seen standing in front of the target machine. The target quickly lifts up, and Blue Toad fires a paintball at it. He leaves, and the players come into play. The minigame then begins. The players must press the corresponding button shown on the target as quickly as they can to score points. First place awards nine points, second awards six, third awards three, and fourth place earns one point. If a player presses the wrong button, then no points will be awarded. After three rounds, the player with the most points wins. Rules – NTSC "Wait for a button to appear on the target, and then press it as quickly as possible to fire a paintball." Rules – PAL "Wait for a button to appear on the target, then press it as quickly as possible to fire a paintball. This page was last edited on May 23, 2018, at 06:08.